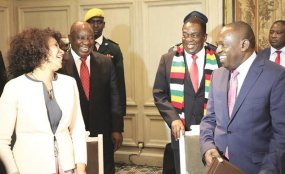 Presidents Mnangagwa and Cyril Ramaphosa yesterday agreed to accelerate implementation of agreements covering various sectors of the economy during the third session of the Zimbabwe-South African Bi-National Commission held in Harare. President Ramaphosa arrived in Zimbabwe on Monday for the BNC summit. Zimbabwe and South Africa signed 45 deals covering various sectors of their economies ranging from mining, trade, railways to air transport. Some of the deals were signed during the First Republic but were never implemented and the Second Republic under President Mnangagwa is keen on ensuring that they take off. Yesterday Zimbabwe and South Africa signed one more Memorandum of Cooperation on Agriculture. Presidents Mnangagwa and Ramaphosa oversaw the signing of the MoU. President Ramaphosa described yesterday’s summit as one of the most successful Bi-National Commission summits between Zimbabwe and South Africa as it covered a wide range of issues of mutual benefit to the two countries. Addressing journalists after the summit, President Ramaphosa said: “You may be interested to know that our discussions at the BNC level have covered a wide range of issues covering issues of investment as well as trade, issues that touch on customs, air transport, railways, water, mining – a full range of issues. “In fact, they have covered up to 45 types of agreements. This has been one of the most meaningful BNC we have had and we did not just specifically focus on one issue. We focused on variety of issues and dealt with challenges that really beset both our economies and our countries and we have agreed that we are going to have continued dialogue on a number of issues including investments as well as issues that have to do with finance and economy. President Ramaphosa said they also discussed in detail a financial package for Zimbabwe. “So the matters that you are raising that you referred to as financial assistance, we discussed that in great detail and our discussions are ongoing and our various teams are busy and because of the strength of our relationship we have no doubt whatsoever that we are going to find solutions that are going to meet the strengthening of our two respective economies so that we can address the challenges that both our countries are facing at this point in time,” he said. In his closing remarks, President Mnangagwa said South Africa was Zimbabwe’s biggest trading partner. As such, he said Zimbabwe would always respond favourably to the investment needs of South African investors. “I wish to applaud the signing of yet another MoU by the two sides. This MoU will facilitate increased cooperation in the field of agriculture,” he said.